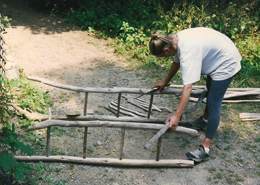 Rustic artist and author Daniel Mack will introduce participants to the basic construction techniques, materials, and tools of rustic work, and guide us as we learn by working on our own projects with driftwood and dry saplings. During the workshop, we can expect to finish at least two projects. Chairs and benches are popular, but some people prefer more sculptural approaches to the materials. This class is excellent for people who have never used a drill or a hammer, but it will also surprise and challenge experienced builders and craftspeople as they encounter the subtleties of the rustic ways of making things. What to Expect: Increased facility with tools and techniques; Better understanding of personal sense of design, and motivations for Making; Greater appreciation for breadth -- the “grammar” -- of natural materials. *Items marked with an asterisk will be available at the Shakerag store. I explore the forms, textures and deformities of the trees. I separate the trees from the forest, re-present and re-member them. I want to keep the history of the tree present in the work and still reflect the hand and heart of the maker. Daniel Mack has worked with natural materials for 30 years as an artist, furniture maker, and architectural consultant. In the 1970s, he was a network television and radio producer and talk show host, and he has taught writing and media at several universities. Currently he works with saplings, logs and driftwood to make rustic furniture, sculpture, and now architectural installations. His most recent work is bark work at the newly renovated Bear Mountain Inn, which reopens in August. His furniture work is in many major collections, including the Smithsonian. Mack’s rustic approach is to work with the characteristics of natural elements and not just use them as anonymous materials. He works in the tradition of the bodger, that craftsman in the woods who sees and collects the beauties and eccentricities of nature. Mack has taught people how to make rustic furniture for 25 years and has written several books. He has taught nature studies in public schools and has been teaching at The Omega institute in Rhinebeck since 1996. Last year, he worked in the Arts and Oncology program at Benedictine Hospital in Kingston and has been developing arts programs for veterans as part of his work with the Orange County Arts Council. He is very interested in learning more about the healing qualities of work in and with nature. Currently, Mack runs Rustic Furnishings, Inc., which provides rustic furniture and architectural services. He is working on a collection of figures carved from bark he collects from the banks of the Hudson River. His sixth and seventh books were published in June, 2008. He regularly teaches workshops on rustic work and creativity. He is writing Hair on the Shower Wall, an approach to creativity based in archetypal psychology. Since 1997, he has been on the Faculty of The Omega Institute for Holistic Studies in Rhinebeck, NY. He is on the Board of Directors of the Orange County Arts Council and is President of the Board of Community 2000, a community visioning organization in his hometown of Warwick, NY.